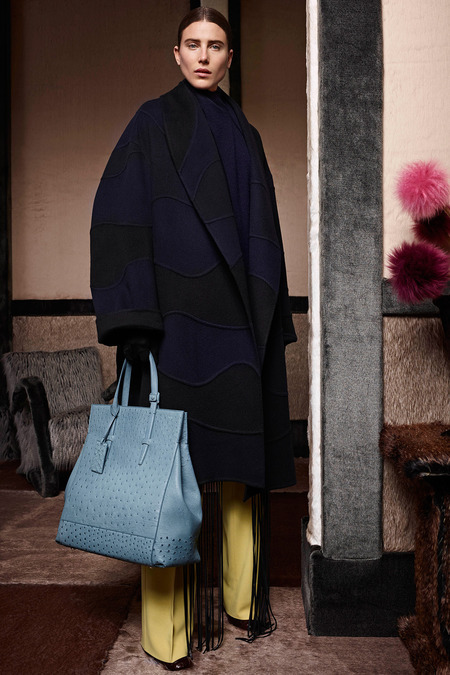 Fall 2014 marked Stefano Pilato’s second collection for Agnona and in it, he took the brand back to its 1953 start with retro-inspired silhouettes and pops of bright hues. Capacious coats, pleated wide-leg trousers, silky blouses, and form-fitting LBDs featured undulating waves of color from turquoise to hot pink. I live for a black jumpsuit and there were two present here that were utter perfection. From a cowl turtleneck to a ruffled train, the designs gave a sophisticated spin on the classic. I cannot wait to see which Hollywood starlets opt for the brand’s pieces this year. I can definitely see beauties like Lupita Nyong’o, Naomie Harris, and Rita Ora sporting the spirited but elegant ensembles on the red carpet. Visit www.agnona.com for more information.